Looking for Custom Awnings Near Me? Why Choose Us! Home » Blog » Looking for Custom Awnings Near Me? Why Choose Us! Rain or shine, the right awning will help you enjoy more quality time in your outdoor area. But an awning that clashes with your home’s architecture will only leave a dark cloud hanging over your property. 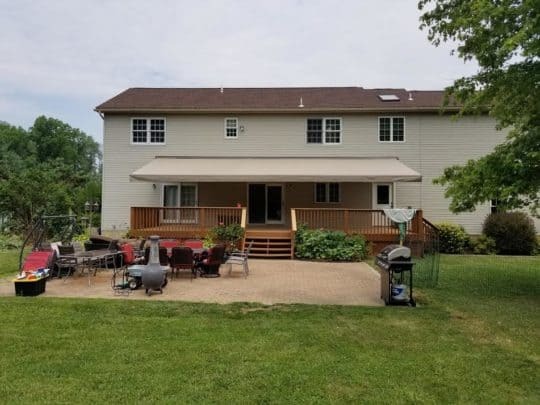 Searching for “custom awnings near me“? At Paul Construction and Awning, we install canopies engineered to provide you with the best in protection, durability, and convenience. Our awnings are available in a wide selection of colors and fabrics, so you won’t have any trouble finding the perfect match. Over the past two decades, our pros have installed custom awnings at a variety of homes and businesses. Our crew’s extensive experience allows them to offer superior installation and maintenance so our awnings stay beautiful and functional for years to come. Get better outdoor coverage today by calling 610-287-1623. Which Awning Is Right for My Home? Choosing an awning that provides adequate protection against the elements while blending seamlessly with your patio or deck can be difficult. Fortunately, our pros have the knowledge and expertise to advise you on the best size, frame, features, fabrics, and colors for your new canopy. During a free in-home consultation, our team will evaluate your outdoor area, listen to your ideas, and explain how they will turn your vision into a reality. We can provide you with sketches or designs of our plans to ensure you are happy with the direction we are taking. Our goal is to create an outdoor space that lives up to your highest standards. We install a variety of awnings ranging from small, single-window canopies to large retractable awnings designed to provide coverage for expansive patios and decks. We also offer added features such as motorization to unlock a world of convenience. Your search for a custom awning has finally come to an end. You won’t find a more committed, hardworking, or efficient team than the specialists at Paul Construction and Awning. We guarantee a three-week order to installation period for all of our shade products. Spend less time battling the elements and more time enjoying the outdoors; call 610-287-1623 today to find out more about our custom awnings! ← What Makes Our Roll out Awnings for Patios Superior? © 2019 Paul Construction & Awning Company. All Rights Reserved.